Britons could see train fares slashed by up to 10 percent if the railway network was brought back under public ownership, a study by campaigners has revealed. Passengers struggling to pay for season tickets could benefit from “massive” savings if profits creamed off by private operators and shareholders were reinvested back into a nationalized railway service. Research by Action for Rail found that £1.5 billion could be saved over the next five years, as contracts held by 11 private firms operating the rail network come up for renewal. With the potential savings, campaigners claim the government could introduce free off-peak travel for children traveling with their parents, season tickets could be cut by 10 percent by 2017 and by 2020 all ticket prices could be reduced by 3 percent. Action for Rail estimated £520 million of savings could be made if shareholder dividends were given to the government. The report comes as a poll of 1,000 voters found only 17 percent want railways to remain in the hands of private companies. The group We Own It, which compiled the results, said 40 percent of respondents wanted to see the whole network controlled by the state. It follows separate research which revealed British travelers pay twice as much as a proportion of their salary on rail fares as passengers in Germany, France, Italy and Spain, where railways are publically owned. The publication of the report also coincides with a day of action, with events held at more than 40 stations in the UK. Frances O’Grady, TUC general secretary and chairman of Action for Rail, said: “The UK has the most expensive rail fares in all of Europe. “If services were run by the public sector, it would make a big difference to families and hard-pressed commuters, who have suffered year after year of wage-busting fare increases under privatized rail. “This report highlights once again the huge cost of privatization to taxpayers and passengers. Money that could be spent on making journeys cheaper is instead being siphoned off into shareholders’ pockets and wasted on bidding and other franchising costs. 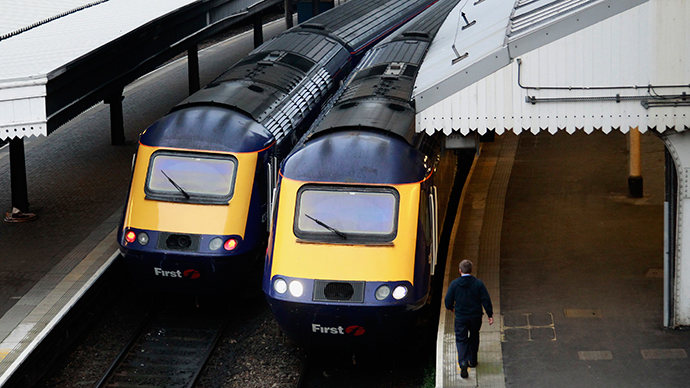 Transport will become a point of debate in the weeks leading up to the general election. The Labour Party is expected to broach the issue in its election manifesto, following comments from former Deputy PM John Prescott, who spoke in favor of ending privatization. The only parties openly vying for re-nationalization are the Green Party and the Trade Unionist & Socialist Coalition. A spokesman for the Rail Delivery Group, which represents Network Rail and train operators sounded a cautionary tone. “The figures from Action for Rail should be taken with a large pinch of salt. Compared to the late 1990s, train companies are paying five times more money to government, largely because of phenomenal passenger growth on Britain’s railway, helping to fund big investment in better services.